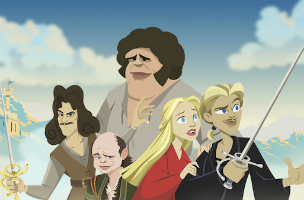 Gameblend Studios has announced the release of The Princess Bride: The Official Game on iOS devices. The game is based on William Goldman’s fantasy romance novel and the 1987 film by Rob Reiner, and sees players experiencing some of the story’s classic moments through four individual mini-games (along with images and sounds from the film). Players start with the Shrieking Eels mode, which sees them tapping on waves of eels as they appear in the water surrounding Buttercup. Eels move quickly, also come in multiple types (including boss eels), with some requiring more than one tap to be defeated. Players earn points for each eel they successfully defeat, and the game ends when one reaches Buttercup in the center of the screen. Once players have defeated 100 eels in the Shrieking Eels game, they’ll unlock the Cliffs of Insanity game. This game sees players titling their device left and right to guide Wesltey up the mountain, and tapping and holding on the screen to make him climb faster. Players must avoid obstacles as they climb, including falling rocks and seagulls. Players can collect hearts to protect them from damage, as well as coins. Each of the game’s modes offers five quests to complete and five stars to earn, and players will need to collect these stars in bulk in order to unlock additional games, based on a sword duel with Inigo and a wrestling match with Fezzik. The game will receive free content updates going forward, with one challenging players to run through the Fire Swamp, as an example. When players fail any of these games, they can spend a magic pill for a second chance. Players start with a small supply of free pills, and can purchase more via in-app purchase. Players can also purchase immediate access to all of the app’s mini-games, if they’d rather not earn them over time. The Princess Bride: The Official Game is available to download for $3.99 on the iTunes App Store.